Today I want to share with you an online boutique that I love, Mindy Mae's Market. There are so many boutiques out there, some that offer the same things as others and some that are completely different. This one I find has some unique pieces that I love and really want to get my hands on. 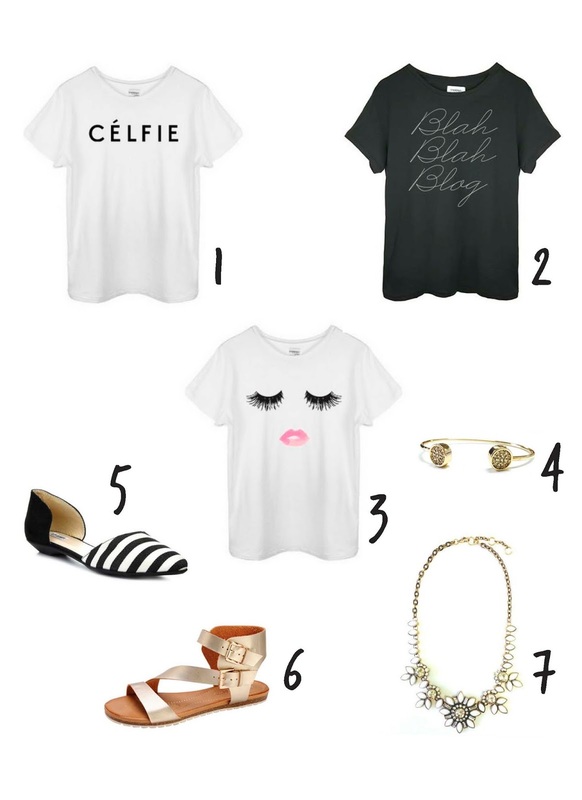 Some more quirky than others, like the lashes and lips tee (my fave! ), but either way, some great options for summer! I get questions quite frequently on where I purchase a lot of my clothing/accessories. It used to be more department stores, Marshalls, TJ Maxx, etc., but now I've transitioned more to the boutiques. Don't get me wrong, I can't pass up a good deal at TJ Maxx or Nordstrom Rack (they'll always be my first crush), but it's good to step out and find some new places as well. I would love to share the places I check out on a regular basis and what I'm loving from each spot as well, if that's something you guys are interested in. Just let me know! Love these T-shirts!! !and the gold sandals! Aren't they just the most fun t shirts?! You can never have too many!